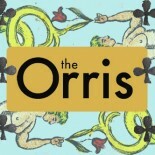 The Orris asked multimedia artist Hilary Emerson Lay to share her thoughts on creativity, inspiration, and making a career in the arts. 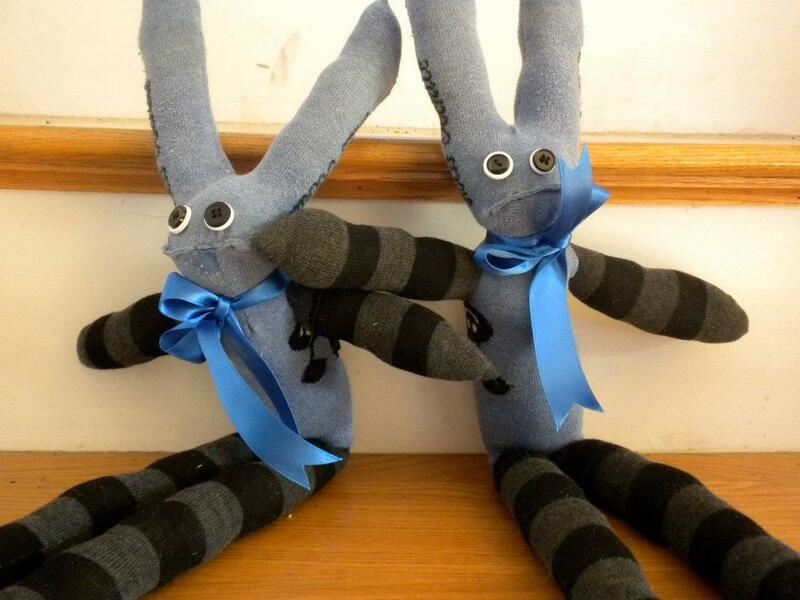 We welcome you into her playful world of sock critters, self expression, and perseverance. 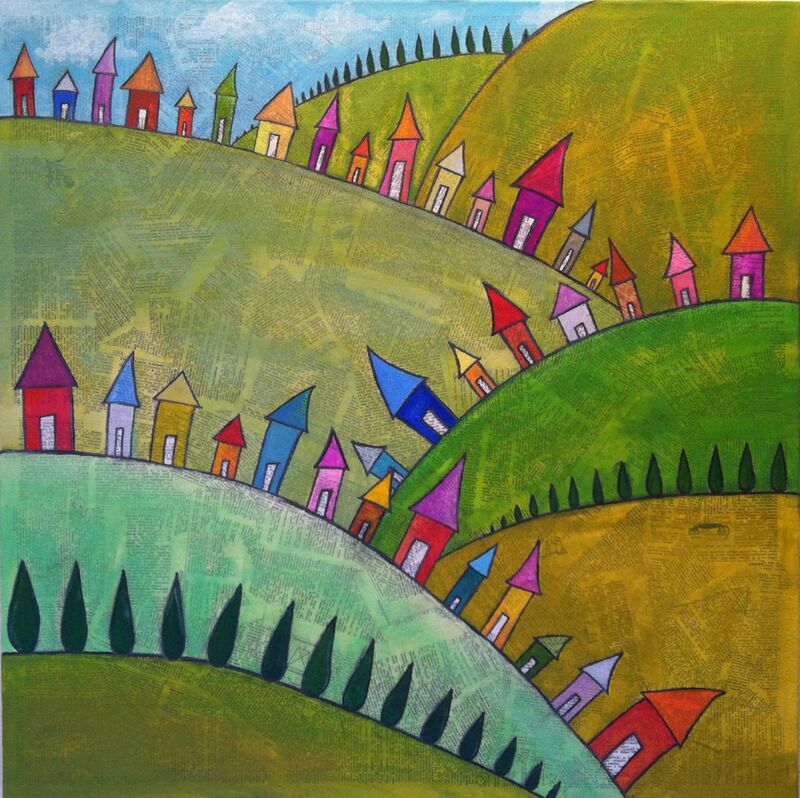 Tiny Hillside Town, 24″ x 24″, dictionary, charcoal, and Acryla gouache on canvas, 2012. My teachers started referring to me as an artist way back when I was in kindergarten. My parents are both extremely creative and imaginative people, so my sister and I grew up doing things like making our own advent calendars and leaving hand-made cards on our neighbors’ doors on May Day, and loads of other things we never thought were unusual. I wasn’t until I was older that I realized that most ‘normal’ families never did lots of the things we did, and that I had been raised to see the world a little bit differently. And it wasn’t until 2006 (the year I started my website) that I really began calling myself an artist. Something about the legitimacy of having my own website gave me the courage to identify myself. Maybe it was the fact that I could hand my business card to someone and say “See? Look what I do!”. Everything. Children’s storybooks. Snowstorms. Animals. Other artists. Old postcards in antique shops. Things I find on Pinterest. Dreams. Conversations with friends. Conversations with strangers. Inspiration is absolutely everywhere; it’s just a matter of what speaks to you. Whimsical, quirky, colorful, playful, sweet, funny. My art is just an extension of my personality. People often remark upon the fact that I look like my paintings and sock critters. What is your artistic process like? How do you work best? I tend to work rather erratically, where I’ll furiously make art for three days and then won’t do a thing for a week. I live off the momentum that builds when I’m making art, but it’s also exhausting, and I wear myself out. Making art can be lonely, so I tend to get more done when I’m creating alongside a fellow artist. I’ve recently been working on making sock critters and sock monstahs to restock my Etsy shop, and I’ve been inviting my friend over to crochet next to me while I sew. We make a cozy fort in my living room and eat cheese and olives and listen to Motown. Before I know it, six hours has gone by and we’ve both gotten a ton of art done. We call each other art-ners. I am lucky to have a lot of different artist friends in my life, and we all alternately encourage or yell at one another to keep each other motivated. Making art is sometimes a group effort. 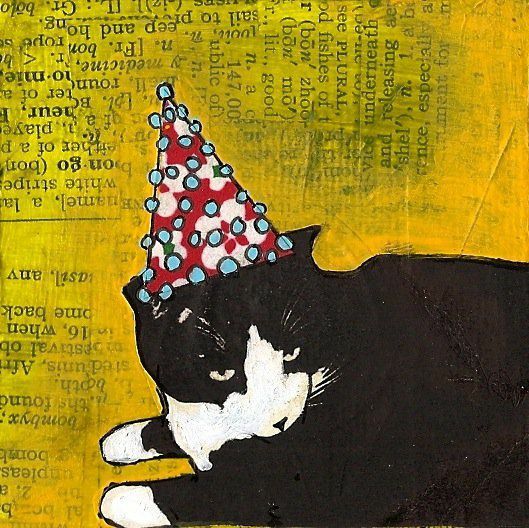 Eli’s Party Hat, 3″ x 3″, photo transfer, origami paper, dictionary, pen, and Acryla gouache on canvas, 2011. What kinds of materials do you work with and why? I cover my canvases with pages from old dictionaries, and then paint over this with Acryla gouache, which has a remarkable rewetting property which allows me to make the colors as bold or as subtle as I want. I’ve always been attracted to the way printed words look on a page, and I love going back and looking at one of my pieces after it’s finished to see what lines of text I ended up using. I also work with ephemera that a man from the Cape send me every few months. He inherited a vast collection of old books, receipts, brochures, journals, advertisements, you name it, some of which date back to the late 1800s. He happened to see an article about me in the Cape Cod Times about a year ago, saw that I used text in my work, and began sending me packages of papers to use. He’s a great penpal to have. 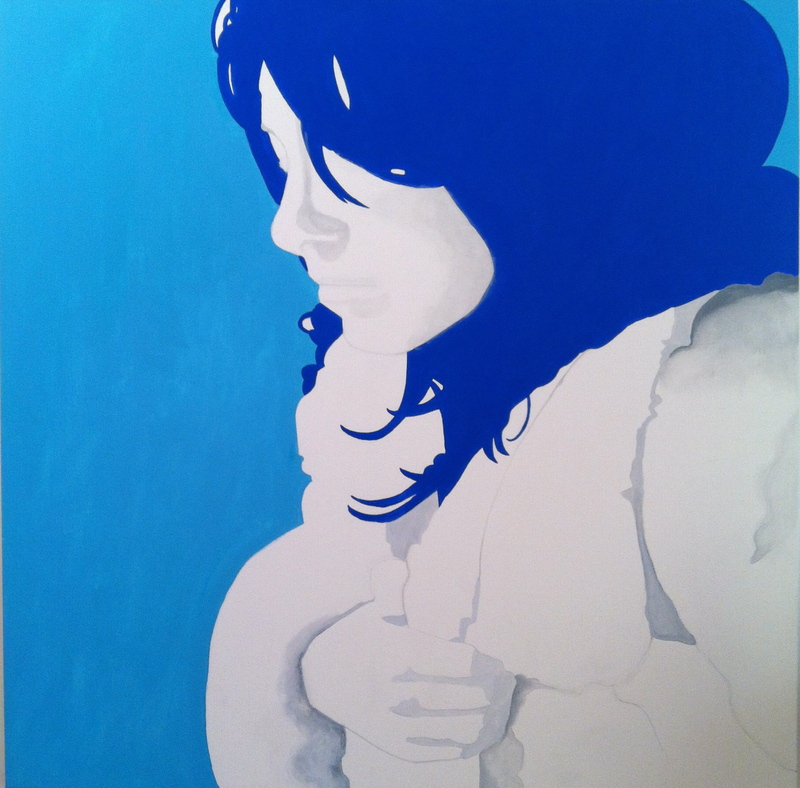 Tracy (part of the Self-Portrait in Wigs series), 36″ x 36″, Acryla gouache on canvas, 2012. You teach artist workshops, especially focusing on artist professionalization. What advice would you give to a starting artist? My advice to someone just starting out on their journey to become a successful artist is to treat your art like a job right from the get-go. You’d never slack off at your day job; apply the same work ethic to your art. (And stop referring to your day job as your ‘real job.’ Start calling it your ‘other job’. You’re an artist, damn it, and that IS a real job!). Get yourself out there. Make (or have made) a fantastic website of your work. Get business cards and have them on you at all times. Join your local arts council. 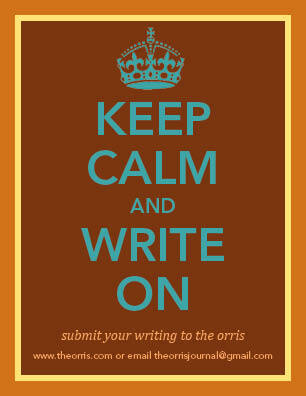 Get on the mailing lists of local galleries and arts organizations and submit your work to every relevant show. Whenever you have your work hanging anywhere, get press. Email your local papers and send them jpegs of your work. You’d be surprised how often it works. Be organized. I have two chalkboards over the desk in my art studio, one for specific commission requests (and the date by which they’re needed) and the other for general requests people have made. Be reliable. When someone emails you about your art, respond immediately. If someone needs a piece by a certain date, get it to them early. Being a successful artist is hard enough as it is; you don’t need the reputation of being flaky and unreliable on top of that. A happy customer can easily turn into a repeat customer. And repeat customers tell all of their friends about you. In my workshop called “Thinking Outside the Gallery Walls,” I encourage artists to explore avenues other than just traditional art galleries through which to sell their work. Gallery shows are important; they’re great for your CV, and you might make a lot of connections. That being said, I’ve made plenty of connections—and more money—hanging a show in a cafe for a month. In fact, I’ve done a whole lot of shows at cafes. Cafes tend to take 0-30% of your sales (as opposed to 40-50% at galleries) and what better way to get your work seen than hanging it right next to a line of bored people waiting for their morning coffee? Craft fairs are another venue you can try, although they are extremely hit-or-miss. Do research on a fair before you apply; make sure it’s a good fit for your art, or else you’ll waste the application fee and about fifteen hours of your life. If applicable, have your art turned into greeting cards and postcards and magnets. You can sell these at local stores (bookstores are a great place to try) and you can also toss in a couple of them with an Etsy order. People love extra goodies. Another tip I have for new artists is to both give stuff away, and to stop giving stuff away. I run frequent contests through my Facebook page where I give away a tiny painting or set of greeting cards, which keeps people engaged with what I’m doing online. But I also advise people to get over the uncomfortableness of charging friends for your art. I used to give my art away to my friends for practically nothing. But if they’re willing and ready to pay full price, charge them full price. Learning to value your own work is priceless. Erin (part of the Self-Portrait in Wigs series), 18″ x 24″, pencil and Acryla gouache on paper, 2012. How do you feel about the state of the art world today? And, where do you see your place in it? In the last ten or so years, I’ve noticed a trend towards producing work that would be categorized more as ‘craft’ than traditional ‘fine art,’ but there’s also been a reclaiming of the whole idea of crafting as a legitimate thing. In large part due to the enormous popularity of craft shows like Bizarre Bazaar and sites like Etsy, people are realizing that you don’t have to have gotten a degree in fine art to be able to make a living (or at least a bit of money) as an artist. It took me many years to become comfortable with the idea of myself as being a ‘real’ artist; I can’t render a gorgeous, photorealistic portrait in oils, but then again, fine oil painters can’t produce the kind of work that I do. I teach a series of workshops on social media marketing for artists where I show people how to establish an effective web presence and have fun while promoting themselves. I’m very outgoing and friendly and a natural self-promoter, so part of my ‘role’ in the current art world is to help artists embrace the idea of being artists. I think the world of art has expanded its definitions over the last decade. There’s plenty of room for everyone. More and more people are thinking of themselves as artists, which is a great thing, because the world always needs more of us. You mentioned the resurgence of craft culture in recent years; what does craft mean to you? Because I am both a painter and a sewer, I reside in the gray area between what’s ‘art’ and what’s ‘craft.’ Although my paintings are mixed media, I still consider the process to be painting–although lots of mixed media painters would call it something else. All categories of visual art, be it painting, sculpture, ceramics, are open to interpretation. But I think the word ‘craft’ is the most undefined of all. 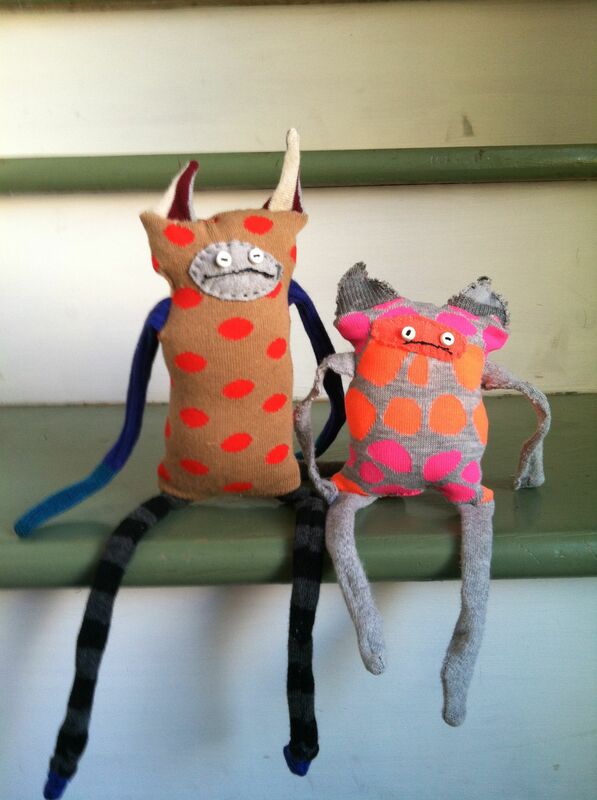 I consider my sock critters and sock monstahs to be crafting, but they can also be called ‘soft sculptures.’ I say label your art however you want to. You’re the one who has the best insight into what category, if any, it should go. I think it’s impossible to put a value on what art does for the world. For me, it has always been an invaluable form of self-expression. If art didn’t exist, I probably wouldn’t have made it past middle school. For me, art is how I bring joy and color to the world. Without it, I have no idea who’d I’d be. But I’d definitely have lamer hair. Assorted tiny houses, 3″ x 3″, Bristol board, colored pencil, pen, and dictionary on canvas, 2012. You can find more of Hilary Emerson Lay’s work on her website, purchase prints and other creations at her Etsy shop, and follow upcoming events on her Facebook page. 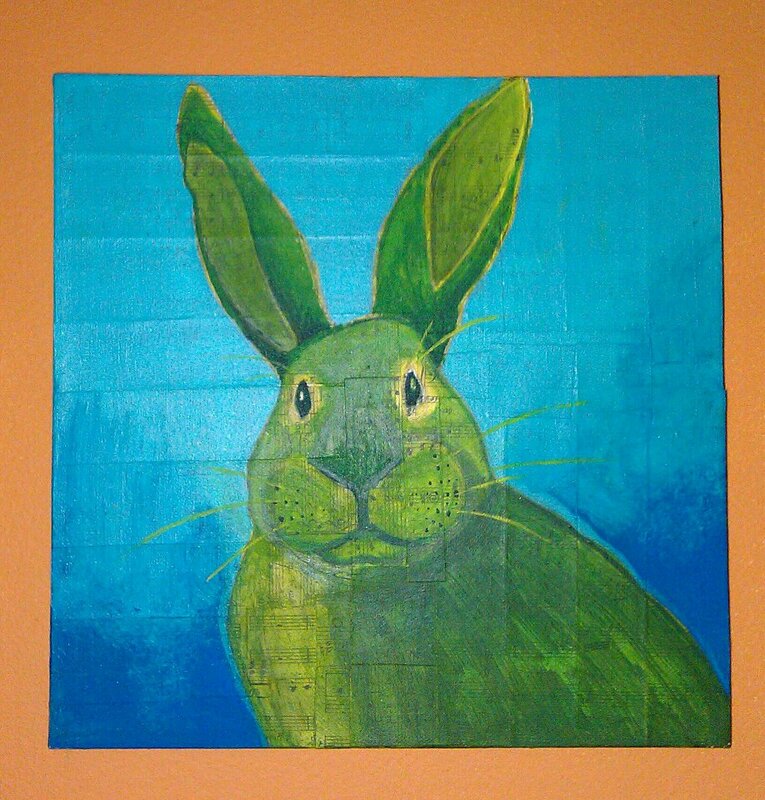 This entry was posted on April 1, 2013 by The Orris in Art, Spotlight and tagged Art, Art world, Artist, Etsy, Hilary Emerson Lay, Sock Critters, The Orris.